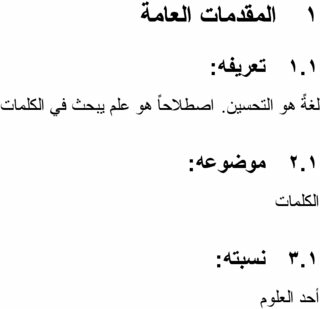 I am using Lyx to write a document in Arabic Language. My problem in numbering of the sections and subsections. So Section 2 is ok, but for subsection it should be ".1.2" (so that we read it from right to left correctly) but as you see in the shot it is ".2.1". So please tell me there is a way to fix this. (please note that I depend on these section and subsections numbering to create Table Of Content automatically). %% LyX 2.1.2 created this file. For more info, see http://www.lyx.org/. %% Do not edit unless you really know what you are doing. I have a feeling this is not really the right way to do this. But here at least is a work around. It won't affect your display in LyX, but should output correctly. Not the answer you're looking for? 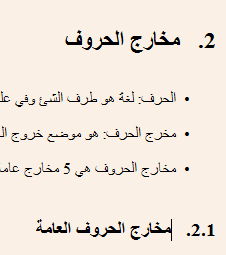 Browse other questions tagged sectioning numbering lyx arabic right-to-left or ask your own question. Change Float and equation numbering format?